In this brief video, B. Kim Barnes introduces some of the main concepts and models of the popular global training program: Exercising Influence™ as a way to improve our abilities in influencing others. See the Exercising Influence program page on the Barnes & Conti website and take the virtual tour. Exercising Influence is the most widely-used influence course globally. Today, the name of the game in any organization is influence. Influence enables you to build the relationships you need to get results inside or outside the formal power structure of your organization. This popular influence training program teaches influence skills using exercising and fitness as a metaphor so that participants can develop strength, focus, and flexibility as influencers. Participants also learn new influence skills by working through real-world business situations. This 12-hour course, participants will teach senior managers and executives the concepts and behavioral skills of the two-day Exercising Influence™ program in an “individual learner” format. Participants will work one-on-one with an influence coach, while gathering feedback and learning the influence “fitness model” (exercising and physical fitness as a metaphor) to develop strength, flexibility, and focus as influencers. The course is specifically geared to the needs of senior level managers; the coaching sessions can be scheduled at the participant’s convenience, and the exercises and influence plan will be tailored to the participant’s needs. In this revised edition of Exercising Influence, Kim Barnes draws on her thirty years of consulting, teaching and observation to demystify the process of influencing others. This vital resource teaches how to accomplish more with less effort. It shows readers how to create work, family, and community relationships that are more balanced and mutually rewarding, and to take charge of their lives in a powerful, ethical, and productive way. Barnes & Conti has developed a helpful reference application for your Android, iPhone, iPod Touch, or even your iPad. 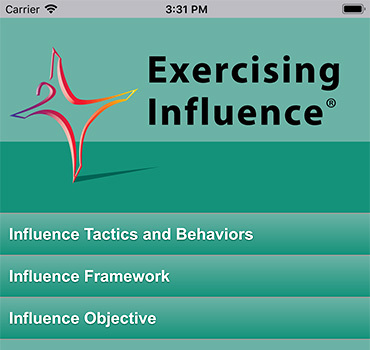 This app references the expressive and receptive influence tactics and behaviors from the Exercising Influence™ program. The app also includes a reference version of the Influence Framework that will help you plan your approach to any influence situation. The app is available at no charge. This article stresses the importance of a clear influence goal, and lays out a practical strategy for keeping that goal clear and focus. Keeping the goal in mind will keep you focused and is more likely to produce a successful outcome. Eric Lewis Beckman is Vice President and Chief Financial Officer of Barnes & Conti. Eric has had 15 years experience providing individuals and organizations with effective design, implementation, and training in influence. Copyright © 1999, 2008 Barnes & Conti Associates, Inc. All rights reserved.